For many application on Google Cloud, phpMyAdmin is only accessible via your local machine using an SSH tunnel. This is done as a security precaution, which you will find configured in the WordPress Bitnami stack on Google Cloud Platform. 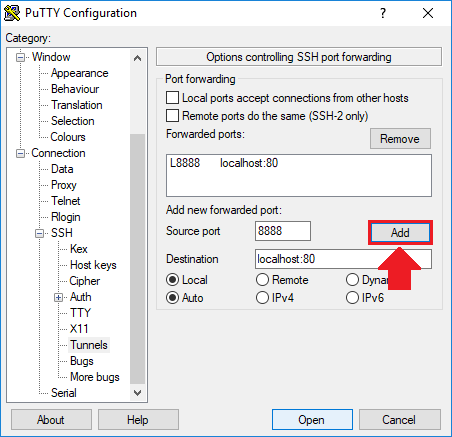 In this tutorial you will learn how to use puTTY as an SSH client in order to establish a secure shell (SSH) connection between your server and your local machine. This secure connection will allow you to connect to your server’s phpMyAdmin page in order to safely make changes to your website’s database. 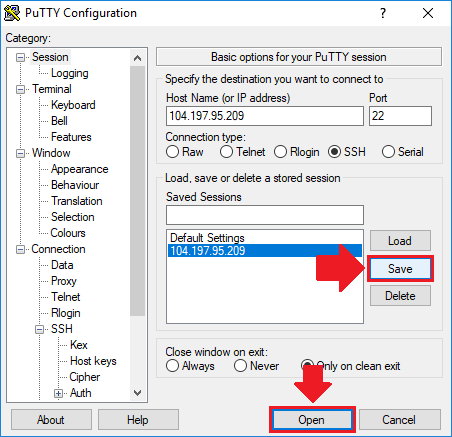 Before getting started with this tutorial, you should have already installed puTTY, which is the SSH client that you will be using in this tutorial. Also, you should have already launched an application on Google Cloud Platform, such as WordPress Bitnami, which will be used as the example in this tutorial. The first step in this tutorial is to download puTTY. 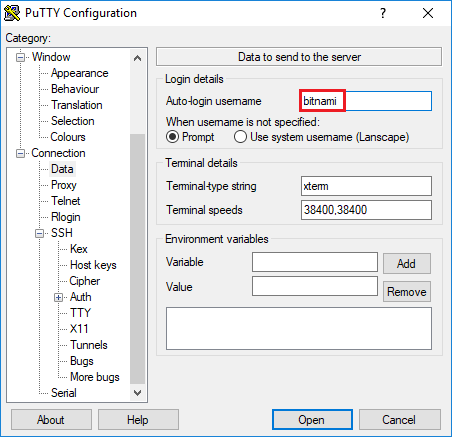 Putty is the SSH client that we will use in this tutorial to establish the connection between our Google Cloud virtual machine and our local machine. Open up the application called puTTYgen. This is the application that you will use to generate a public and private SSH key pair. 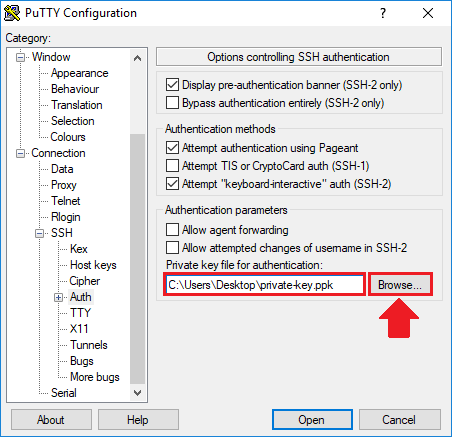 After the SSH keys have been generated, change the key comment to Bitnami, then save the private and public key files to your computer. Next, go to your Google Cloud Platform compute engine VM Instances page, and click on the instance that you are configuring. This will open the vm instance settings page. After opening the VM instance details page, click the edit icon at the top of the page. Scroll down to the SSH Keys section of the page and click the Show and Edit link. 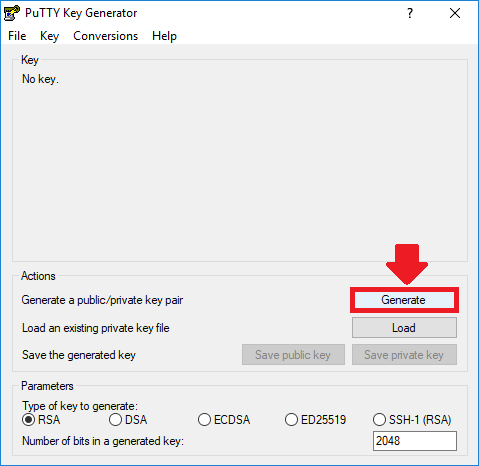 Then, from your puTTY Key Generator window, copy your public key text and paste it into the SSH key text box. Open the main puTTY application (it’s a separate application). 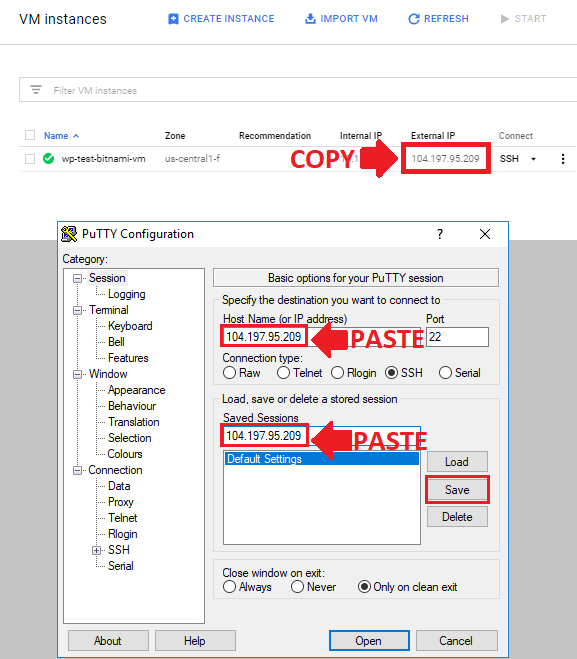 In the Session section of the puTTY category column, paste the External IP Address of your Google Cloud Virtual Machine into the Host Name (or IP address) field and the Saved Sessions field. Next, click the Save button to add the IP address to your saved sessions. Navigate to the Auth section of puTTY under the SSH column. Click the Browse button to specify the path to your private key file. Navigate to the Tunnels section of puTTY under the SSH column. Enter 8888 as the Source port, and localhost:80 as the Destination, then click the Add button. Navigate to the Data section under the Connection column. In the Auto-login username field, enter bitnami. Navigate back to the Session section at the top of the category list. Next, click on the IP address is the text box in order to select it, then click on the Save button to save your settings. Next, click the Open button at the bottom of the page to open the SSH tunnel. If you see an alert message window pop-up when connecting, click the Yes button in the alert message window. After clicking the Open button, you should see a terminal window pop up showing the connection between your local machine and your server. Now that the SSH tunnel has been configured, the last step is to open a new browser window and paste the following text into the URL bar: http://127.0.0.1:8888/phpmyadmin/. This will open up phpMyAdmin. NOTE: If your domain is configured with SSL, then enter https://127.0.0.1:8888/phpmyadmin/ into the URL bar. Now that you’ve configured the settings for both the puTTY Client and your Google Cloud VM instance, you can open the SSH tunnel at any time by clicking on the Open button on the Session page. Great tutorial. But how did I know the username and password of myphpadmin? The password is generated when you first launch the WordPress instance. On Google Cloud, you can view the phpMyAdmin credentials by navigating to Marketplace > Your Solutions. From there, click on the WordPress instance that you deployed in order to show the phpMyAdmin username and password. Well your tutorials are really very very helpful for beginners . 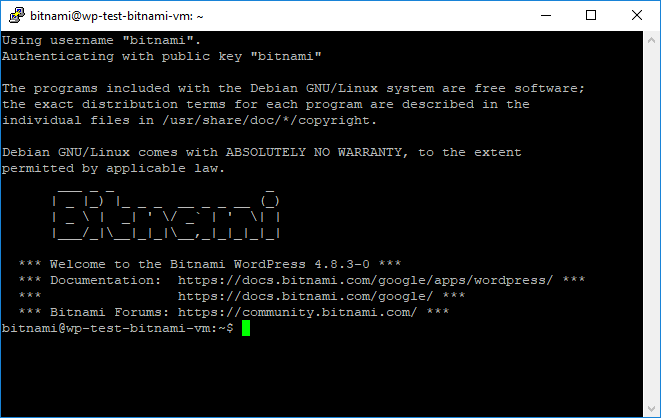 I am using bitnami wordpress as vm instance in google cloud. I used then putty and did the all required steps as mentioned in tutorial. I was successfully able to access phpmyadmin. Check out this comment here from Georgi where he goes into detail about the process! Try accessing the site through another browser aside from Google Chrome. If that’s not an option, try viewing the site through a private window. If it still doesn’t work, please provide additional details of the errors you’re experiencing and I will see how I can help. Comment out (aka put a # to the very left of the text) the redirect from your wordpress.conf file (step 7) and also temporarily undo what was done in step 6 (comment out the SSL certs, and uncomment the snakeoil certs). Then, follow the section from this guide in the section titled ‘Edit functions.php’, add add your WordPress URL without https. Save the changes and restart your server. Then try viewing your site in a different browser or through a proxy, as your default browser will try to serve the cached page with the https prefix. Hi Joe! Thanks for your help. I ended up relaunching a new Click To Deploy Multisite instance. I pointed my Godaddy Domain to GC and changed the url in the settings and now the site is down and I still can’t access PHPMyAdmin for some reason. I followed the instructions I’m pretty sure. I just don’t know why I can’t. I enabled FTP permissions and have access there. Just no access to phpmyadmin. What am I missing? It looks like the site is up (primarlweb.ca), but the /phpmyadmin URL is returning a not found. Did you remember to check the box “Install phpmyadmin” when you deployed the instance? Hi, Thank you for your guide. I want to ask how i can update php version to 7.1 in Google Cloud ? I wouldn’t recommend doing the upgrade unless you are an experienced sysadmin – so proceed at your own risk and with caution. If you’re using Bitnami, you will most likely have to deploy a new WordPress LAMP stack with the upgraded components and migrate your website manually or with the All-in-One WP Migration plugin. If you’re using Click-to-deploy or a similar Apache configuration, you can upgrade the components manually. Check out the following resources from Ayesh, and LinuxTechLab. Remember to create backups of your website before making any changes. It showed me the red screen with error below. could you help ? One of your directories is full, and therefor can’t be written to. You will have to increase the size of the disk in order to be able to write to it. Unfortunately, I don’t have a tutorial on that subject, but you can check the Google Cloud docs for instructions on how to resize persistent disks. The resizing process, as documented in the link above, is a relatively straightforward process; however, it requires that you stop your instance.Make sure that you reserve a static IP address for your VM instance before stopping it. I am using an online server,can I use this tutorial? Yes, you can. 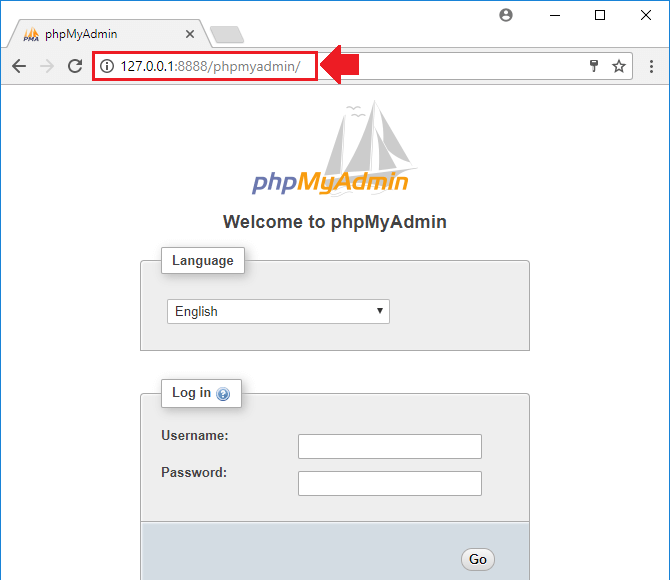 However, with most applications you can access phpMyAdmin directly at yourwebsite.com/phpmyadmin – therefor there is no need to implement the steps outlined in this tutorial. That being said, if you’re using one of Bitnami’s stacks then you will indeed find this tutorial useful for your online server. Which application are you running? WordPress? If so, I would avoid using Bitnami’s stacks and instead use Click-to-deploy stacks because they are easier to configure. Using Click-to-deploy will allow you to access phpMyAdmin directly from your website’s url (yourwebsite.com/phpmyadmin). Its just a normal website with an online database and I need to connect the database with google cloup plartform. This tutorial is not related to what you are trying to accomplish, and I don’t have any tutorials on the subject. Your database credentials are stored in a configuration file, which will be different depending on the application stack that you’re running. This Magento tutorial gives an overview of the general process (for Magento specifically), but like I said, the steps will be different depending on your application stack. however now am phpmyadmin, what’s the user name and password supposed to be ? Your username and password credentials for phpMyAdmin are created when you first launch the instance. You can view them from your Google Cloud dashboard by clicking the hamburger menu in the upper-left hand corner of the screen and navigating to Cloud Launcher > Your Solutions and then selecting your deployment. Once again your tutorial has been great and me without having any knowledge and background in this field has managed to successfully reach phpmyadmin page. However, i also faced the same situation whereby i dont know how to log on. Googled and watched YouTube and there seems to be tons of solutions like username=root, password=null, when that didnt work, change the config.inc.php to no password etc., but all these still did not work out. Saw this thread and looked into Google Cloud dashboard, but there isnnt this Cloud Launcher option available. Can you please shed some lights on this? Thanks! From the Google Cloud sidebar menu, navigate to Marketplace > Your Solutions, then click on the deployment for your application. This will show you a dashboard with your phpmyadmin username and password. Again, just moments after submitting my last reply, i’ve managed to find the solution, simply by using “root” as the username instead of “user” as what showed on the Google Cloud dashboard, and using the same admin password (temporary). I’m glad to hear you got it working – and thanks for sharing the solution! Just wanted to thank you for all the work you have put into this site. I am in the process of building and launching my business website using Bitnami WordPress on the gcp and I have you to thank for getting me this far. You have the single best, most complete start to finish walkthrough for someone like me that knew absolutely nothing at the start of this endeavor. Whenever I googled how to do something your site came up again and again, with exactly what I needed, presented in a way that is easily understood. I eventually just pinned your site in my browser to save time. My site is up, working correctly with the correct domain, my theme is installed and my dummy data is plugged in. I’m all set to customize the site and input my own content. You deserve an awesomeness award for sure! Thanks so much for the positive feedback Crystal – I love hearing stories from people who were successful in migrating their websites to the cloud. though at first it stressed me out because whenever I access local:8888/phpmyadmin I always redirected to home page of the actual site. and all the tips in the comment section didn’t worked for me. I use SSL on my site by the way. But I finally can now access phpmyadmin by excluding phpmyadmin from force always HTTPS. and then I can access phpmyadmin with port 80, while my site still always HTTPS. Awesome – sounds like a great workaround! Thanks for sharing the details! Thank you for the great tutorial, it helps me a lot. However, i would like to ask 1 question that i want to upload my themes / plugins through Filezilla, and where should i locate the themes / plugins file? I’m glad the tutorial helped you! I have configured the install (Bitnami WP) to use a URL instead of the IP, and have the free SSL enabled (your tutorials – great resource!!! ), and when I try to tunnel in, it redirects to the URL, not 127.0.0.1. Any advice on getting that redirect to be avoided? I’m not sure how to get that working. You’re not the first person to complain of that issue, but I’m also not sure how they got it resolved. My advice would be to check StackOverflow and try contacting Bitnami support to see if they can help since the issue seems to be unique to their WordPress stack. Please let me know if you find the solution. Found it – if you set up the connection in Terminal using ssh -N -L 8888:127.0.0.1:443 -i ~/.ssh/wherever/keyfile name@[my ip address] then connect to https://127.0.0.1:8888/phpmyadmin/ it seems to be able to bypass the IP redirect. Thanks for finding this solution – I know a lot of users will find it helpful! >> Clicked on the ‘Not Secure’ on —-Chrome browser—- and read ‘Certificate Invalid’ ??? …but test on https://www.ssllabs.com/ssltest/ passed with ‘A’ level ??? FIXES: As per instruction on VIDEO link below – username ‘root’ and ‘password inside my VM instance’ was accepted. Is there anything I should be worried about or is there any alternative fixes for this? Just choose the option for “trust anyway” – it will not pose a security issue. This is because you are accessing your website’s back-end through localhost, so there is no third party validating the authenticity of the certificate. A lot of people have been asking about how to adapt this tutorial for Mac, so I will point them to your comment! It enters to the next line and just sits there! I thought it might have been because I had the firewall check on in my GCP instance but I turned it off and still can’t connect! I used this the following command without the ‘.pem’ because I got an “No such file or directory. Permission denied (publickey). error when adding that. The permissions is set to the highest at 775. Can anyone suggest someone I’m missing? UPDATE: I figured this out. Just wanted to share my issue and solution for others with little experience like me. Thank you for your very helpful work! These are very great tips for people configuring SSH tunnels with SSL configured!